Author Kate Chopin likely penned those words with post-Civil War Louisiana in mind, but they apply every time the gentlest season returns to Charleston, South Carolina, too. While restaurants, architecture, and shopping net the Holy City accolades, its eternal charms lie in its simple pleasures­­­—strolling the cobblestoned neighborhoods south of Broad Street, peeking at verdant private gardens through scrolling iron fences, and catching the burbling of fountains on the secret side of courtyards. If on past visits you’ve beelined straight to the Lowcountry beaches, that’s understandable. But if you’ve not taken in the city’s graceful gardens, plantations, or mansions, you’re missing out. Spring here is a marvel on every level, and here’s how to take full advantage. The next best thing to getting invited to a Charleston garden party is buying your way in via a home and garden tour. The tours are so top-notch (think centuries-old homes and coffee table book-quality gardens), even locals volunteer as docents in exchange for passes. The Historic Charleston Foundation, which has championed and saved some of the area’s most significant properties, puts on one such outing. This year, its 68th Annual Festival of Houses and Gardens runs March 19 through April 19 and includes a mix of tours, walks, talks, and the well-heeled Charleston Antiques Show. 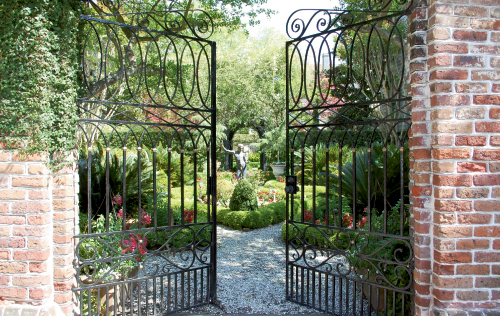 Another stalwart on the tour calendar is The Garden Club of Charleston’s House and Garden Tour, which celebrates its 80th season this year on April 10 and 11. Passes provide entry into six private gardens each day, including one group in the South of Broad neighborhood and another in Ansonborough, just north of the City Market. Master gardeners are present in each home to field questions from green-thumb visitors. A little later in the season, Spoleto Festival USA, the city’s renowned performance art extravaganza, hosts its third annual Behind the Garden Gate tour May 23 and May 30. For two Saturdays, 16 gardens throughout downtown and the outlying islands host this self-guided affair. Expect everything from meticulously groomed beds to overflowing cottage-style landscapes. To get a better sense of how Charleston secured its place in the colonies, head off the city’s main peninsula to wander the sprawling grounds of its nearby plantations. While there are history lessons at every turn in these environs, focus on the chapters concerning horticultural feats and still-entrancing beauty. At Middleton Place, about 40 minutes out of town, some of America’s first camellias were cultivated in the 1780s. Today, camellia gardens, stepped terraces, precisely planted octagonal gardens, and the original home and outlying buildings encompass 110 acres. Each spring, azaleas take over the property in a shower of confetti colors rivaled only by the sweeping views of the Ashley River. A short drive up the road, Magnolia Plantation & Gardens offers 390 acres of wild gardens that include an expanse of boardwalks wending through an otherworldly swamp. Here, azaleas first took root in America, and some of the oldest varieties in the country still thrive. Visitors can explore a hedge maze, quaint bridges, towering live oaks, and a river walk with former rice fields in the distance. If you have time for a day trip, head to Moncks Corner for two off-the-path escapes. Cypress Gardens has graced the silver screen several times (look for swamp scenes in The Notebook and The Patriot), and a trip there makes it clear why. Not even Hollywood can fake the wooded paths riddled with heirloom daffodils and azaleas. You can also rent rowboats and cruise among Spanish moss-draped cypress trees. Nearby, the stunningly understated Mepkin Abbey awaits. Once the home of Revolutionary War figures Henry and John Laurens and later publishing magnate Henry Luce, the property on a bluff overlooking the Cooper River now houses a monastery for Trappist monks. Visitors come to enjoy the serene setting, learn about life in the order, and wander the gardens that Luce’s wife, Clare, cultivated. If you’re not able to visit during garden tour dates, and you can’t make it to see the plantations and estate-size gardens, don’t fret. Several historic properties downtown offer fantastic home and garden tours on a daily basis. The Nathaniel Russell House on Meeting Street is just one of those. The Historic Charleston Foundation restored the interior to its former grandeur, and the surrounding planted beds and private lawn are just as delightful. Wander the house and peek out to see how its original owners would have seen the green spaces. On the nearby Battery—the seawall that rims the tip of the peninsula—some of the city’s most stunning homes preside over the harbor. The Edmondston-Alston House, another museum home from the 1800s that’s been outfitted in period appointments, is one such mansion. Of note are the sweeping porches that would have allowed residents to take in the views, breezes, and the first shots of the Civil War on Fort Sumter. Outdoor spaces like these were essential and birthed a porch culture that still thrives throughout the South. For one more treasure, drive up the peninsula to get to the Aiken-Rhett House (near the visitors center). Built in the early 1800s, it’s a formidable stucco palace, but unlike the other restored houses, it only came into preservationist hands in the 1970s, when its caretakers simply stopped its clock. The result is a property that’s a collage of sparkling chandeliers and gilded portraits alongside peeling wallpaper and threadbare furniture. Its grounds include slave quarters, stables, and outhouses, all rarities in the area. Historic Charleston Foundation operates a terrific gift shop downtown, but to get some of the same home décor and garden trappings that locals incorporate to create Charleston style, you’ll need to pull out the GPS. For ever-changing knickknacks, regional products, and fresh-cut flowers, head to Mount Pleasant and visit Out of Hand. Set amid centuries-old cottage-style homes with picket fences, the shop and its locale are both finds. A few streets away, sofas, light fixtures that bring the outside in, and miscellaneous coastal-chic goodies rule at Celadon, while teak garden furniture, sisal and sea grass rugs, and bolts of fabric await at GDC. For plants, topiaries, fountains, and garden sculptures, take the James Island Connector to Hyams Garden & Accent Store. You also aren’t far from Architectural Antiques & Garden, a salvage warehouse piled high with found doors, ironwork, marble whatnots, and on and on. Like the city, its gardens, and homes, the more you explore here, the more you find to love. A collection of tiny, well-appointed cottages in the Patriots Point portion of Mount Pleasant, these sweet porch-wrapped spots look out onto the Charleston Harbor and are landscaped with palms, bamboo, and other tropical touches. Rates from $499 per night. This family-owned company manages several of Charleston’s historic lodgings, which feature old-school Southern décor and abundant porches and courtyards. Properties include King’s Courtyard Inn, Rutledge House Inn, and Wentworth Mansion. Part of the Relais & Chateaux luxury boutique hotel group, Planters Inn sits just off the Old City Market and hosts rooms that open onto its meticulously landscaped courtyard. This luxury B&B, set in a collection of three early 1800s homes that surround a gorgeous courtyard garden, boasts a lovely bar and restaurant. Rooms from $479 per night. Grab a pastry and a cup of the city’s best coffee or a sandwich and a craft beer and head to the urban courtyard at this local gathering spot. Breakfast, lunch, and dinner are small-plate perfection in this small, off-the-beaten-path eatery steps away from one of the city’s best kept secrets—Hampton Park. Whether you come for breakfast or for the elegant dinner, ask for a table in the outside garden with its fountain and finely planted beds. Built in the 1700s, this church secrets a rambling, romantic overgrown garden that defies the sculpted nature of the city. Enter the gates on King Street (next to Ike Behar at 169 King St.) and wander the lush grounds. Cuttings, shrubs, and blooming plants are for sale as garden lovers learn from lectures, demos, and master gardener advice at this annual free two-day sponsored by the Charleston Horticultural Society. This 60-acre one-time colonial race course with lagoon, antique roses, copper-topped bandstand, live oak allies, and miles of paths is the largest park on the peninsula and a delightful must-visit.